"Bill Asher" redirects here. For the guitar maker, see Bill Asher (guitar maker). 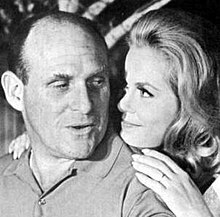 William Milton Asher (August 8, 1921 – July 16, 2012) was an American television and film producer, film director, and screenwriter. He was one of the most prolific early television directors, producing or directing over two dozen series. With television in its infancy, Asher introduced the sitcom Our Miss Brooks, which was adapted from a radio show. He began directing I Love Lucy by 1952. In 1964, he produced and directed Bewitched, which starred his then-wife Elizabeth Montgomery. As a result of his early success, Asher was considered an "early wunderkind of TV-land," and was hyperbolically credited in one magazine article with "inventing" the sitcom. Asher was nominated for an Emmy four times, winning once for directing Bewitched in 1966. He was also nominated for the DGA award in 1951 for I Love Lucy. Asher was born in New York City to stage actress Lillian Bonner and producer Ephraim M. Asher (1887-1937), whose movie credits were mostly as an associate producer. His sister, Betty Asher, was an MGM publicist for Judy Garland. His father was Jewish, his mother Catholic. Asher's family moved to Los Angeles when he was 10, where he often accompanied his father to the movie studio. Asher's parents divorced when he was 11, resulting in a return to New York with his mother. He later recalled that this period was filled with turmoil, as his mother was abusive and an alcoholic. As a result of having to live in New York with his mother, he dropped out of school and served in the Army Signal Corps during World War II. Asher returned to California to direct Leather Gloves (1948), a low-budget film. He eventually gravitated to television (then a new medium), and got a job writing short story "fillers" for various programs, which evolved into a series called Little Theatre. From this work, he gained a contract with Columbia Pictures to work on a film musical for Harry Cohn. Asher received an offer from CBS Studios to direct Our Miss Brooks, starring Eve Arden, a television version of the popular radio show. In 1952, Desi Arnaz asked Asher to direct an episode of his series I Love Lucy; by that show's end in 1957, Asher had directed 110 of the series' 179 episodes, Asher later commented that even though the creators knew the show was good, they did not believe it would become an American icon. "When we did the show, we thought, 'That's it, we're done with it.' We never dreamed it would last this long. Lucille Ball, obviously, was one of TV's true pioneers." Asher was considered an "early wunderkind of TV-land, blazing a path in the new medium" of television. Writer and producer William Froug described Asher as a "hyphenate of a different stripe, a director-producer", commenting that he was one of many "restless Hollywood professionals who, like nomads, drifted from job to job, always delivering competent, if not inspired work". In addition to Our Miss Brooks and I Love Lucy, Asher directed episodes of The Colgate Comedy Hour, Make Room for Daddy, The Twilight Zone (1959 TV series), The Patty Duke Show, Gidget, The Dukes of Hazzard, and Alice. Asher and Montgomery befriended President John F. Kennedy, and, together with Frank Sinatra, planned Kennedy's 1961 inaugural ceremony. Asher's best-known work was Bewitched, which he produced for its entire eight-year run. At that time, he was married to the show's star Elizabeth Montgomery. They divorced soon after the series' cancellation in 1972. Asher also directed several films, including Muscle Beach Party, Bikini Beach, and Beach Blanket Bingo. Television historian Wheeler Dixon later suggested that the Beach Party films were not only "visions of paradise" for the audience, but also for Asher, who used them "to create a fantasy world to replace his own troubled childhood." When I look back at my own work, Bewitched stays with me the most, and Lucy, and the Beach Party pictures. The scripts of the Beach Party films were sheer nonsense, but they were fun and positive. . . . When kids see the films now, they can get some idea of what the '60s were like. The whole thing was a dream, of course. But it was a nice dream. Asher received a star on the Palm Springs Walk of Stars in November 2003. Asher was first married in 1951 to Danny Sue Nolan, with whom he had two children; the couple divorced in 1961. Asher then married Bewitched star Elizabeth Montgomery in 1963. They had three children and divorced in 1973 (soon after the series' cancellation). His third marriage was to Joyce Bulifant from 1976–1993. He adopted her son, actor, John Mallory Asher. This marriage also ended in divorce. In his last years, Asher resided in Palm Desert, California, with his fourth and final wife, Meredith Asher. Asher died from complications of Alzheimer's disease at age 90 on July 16, 2012. ^ Obituary Los Angeles Times, July 18, 2012; p. AA5. ^ "R.I.P. William Asher". Deadline Hollywood. Penske Business Media, LLC. 16 July 2012. Retrieved 17 August 2012. This page was last edited on 14 March 2019, at 16:26 (UTC).